Looking for small business templates? We've got you covered! Do I need more than just a small business invoice template? As a small business, you are relying on quick payments in order to keep your head above water. That means you need to set up a good invoicing system so your clients can pay you as fast as possible. 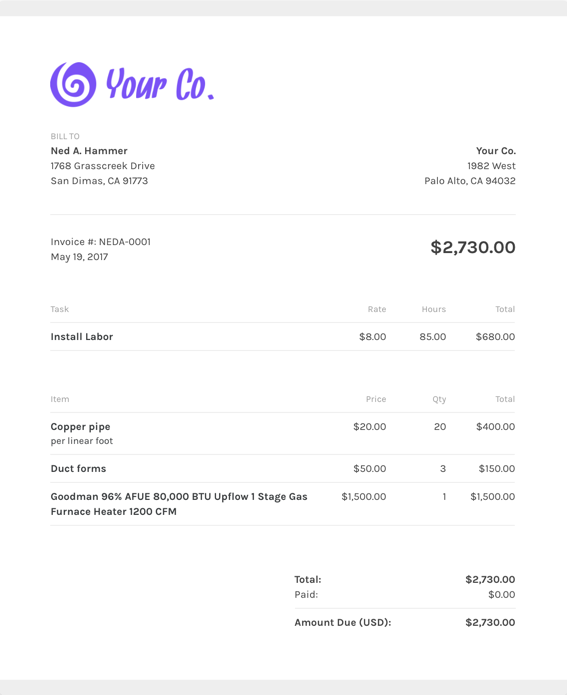 Rather than spending hours struggling to remember who owes your for what service or trying to figure out how to create an invoice yourself, your best, fastest option is to use an invoice template for your small business. Using that template, you can create the same clean, professional look on every invoice you send out. And with ZipBooks, it's free. What should I include on my small business invoice template? A great selling point about ZipBooks is that you can pre-enter all your invoice details into the invoice template. Using ZipBooks for your small business invoice means never forgetting to include critical information. We’ve collected data from tens of thousands of invoices and use it to score your invoice based on what information you include so you’ll get you paid faster.